Driving a couple million dollars’ worth of cars with a total of more than 10,000 horsepower at our favorite track makes us wish we had money. Maybe we could’ve been the guy who recognized the patterns and shorted the housing market to the tune of a few billion. Or maybe we could’ve invented the Mangroomer or Flex Seal. Instead, our personal garages are stuffed mostly with lawn-care equipment and assorted jalopies of lesser prestige. 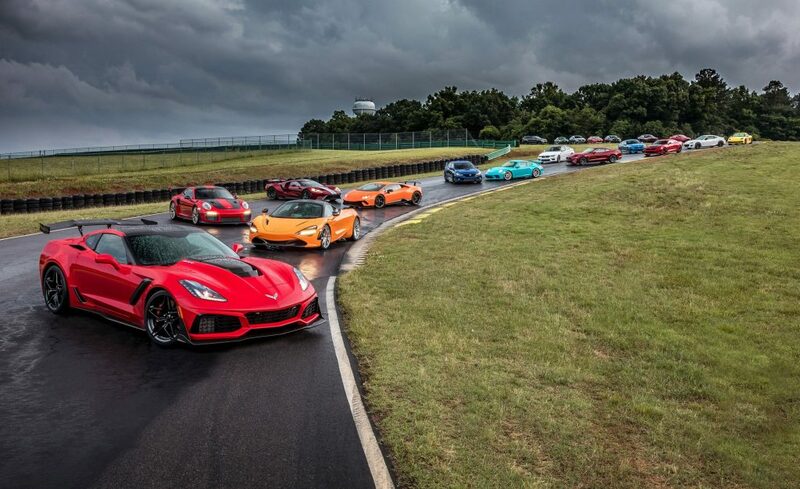 But for three days every year, we caravan down to Virginia International Raceway to establish a pecking order for all the newest performance cars on the market. And while we have to give them back when we’re done, they’re ours for those three days. Let the other guys have their Mangroomers. There is a certain assumption that the more expensive the car, the quicker it should lap. So we include all the go-fast parts in the base price and group cars by their cost (LL1–LL5). Well, except for SUVs. We lump all of them into one group: LLTruck. At some point, SUV track performance will start to rival that of cars, much the way sports sedans did to coupes in the 1960s. But we’re not there yet. Still, cars have come a long way over these past 12 years that we’ve been lapping Virginia International Raceway’s devilish 4.1 miles and 24 turns that make up its Grand Course. Consider that nearly a quarter of the machines we’ve assembled here have at least 700 horsepower on tap. Three of those, the Chevrolet Corvette ZR1, McLaren 720S, and Porsche 911 GT2 RS Weissach, will fight for the top spot, while the two others, the Dodge Challenger SRT Hellcat Widebody and the Jeep Grand Cherokee Trackhawk, fight for the most syllables on a single OEM badge. We’d hoped to put the portly Trackhawk in better LLTruck context, but Alfa Romeo withdrew its Stelvio Quadrifoglio at the eleventh hour and Porsche raised an eyebrow at the idea of supporting four cars. We agreed that the 718 Cayman GTS, 911 GT3, and 911 GT2 RS were the more important and interesting entries, and so the Macan Turbo stayed home, leaving us with just two go-fast 4x4s, the Jeep and a Mercedes-AMG GLC63 S coupe. Alfa also withdrew the Giulia Quadrifoglio, to which we’d extended a return invite after the car suffered mechanical issues last year. That left the 600-hp BMW M5 and the less powerful but equally intriguing Kia Stinger GT to represent mid-size performance four-doors. We added a Honda Accord Sport 2.0T to the sedan roster because readers keep asking for times on the cars they drive every day. We’d bring more family-friendly products if we had the time, but the Accord stands as the benchmark for the commuter class. Its ability on-track was surprising, especially since most mainstream products would buckle at the knees when faced with VIR. Representing the enthusiast end of the affordable spectrum are the newly commissioned, 275-hp Chevy Camaro Turbo 1LE and 205-hp Subaru BRZ tS, both in the LL1 price range. In LL2, Honda’s tantalizing and visually polarizing Civic Type R reminds the world what a red Honda “H” on a car’s nose means, and the Ford Mustang GT Performance Package Level 2 brings Shelby-like track chops to the working man. Hoping to improve on its 2014 performance, Subaru sent another WRX STI, this one a 310-hp Type RA. Audi bridged LL2 and LL3 with a pair of turbocharged five-cylinder MQB-plat­form cars, the RS3 and the TT RS. It also answered the LL3 call with its new 444-hp RS5 coupe. The top of the field was stacked this year. In addition to the 700-hp glut, we had Ford and Lamborghini in the 600-hp club with the GT and Huracán Performante. The GT broke the 918’s record last year by the thinnest of margins, but we wanted to see how it would fare with competition breathing down its neck. Indicative of another industry trend, the Huracán is one of just four cars here without forced induction. All Lightning Lap entries arrive in factory condition or fitted with homologated parts available at their dealerships. It’s been 12 years now, with 242 laps on the Lightning Lap register. This year’s valedictorian also set a new all-time record. Let’s give the kid a round of applause.